The narrow courtyard between the palace's two wings creates the effect of a short, idealized street; view toward the Arno. The Uffizi Gallery (Italian: Galleria degli Uffizi, pronounced ) is an art museum in Italy. It is located in Florence, and among the oldest and most famous art museums of Europe. Visitors observing Michelangelo painting Tondo Doni. 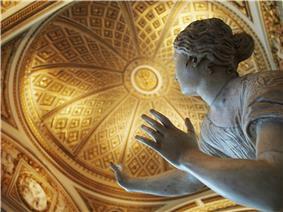 Uffizi is ranked as 25th on the list of most visited art museums in the world, with around 2 million visitors annualy. The building of Uffizi was begun by Cosimo I de' Medici so as to accommodate the offices of the Florentine magistrates, hence the name uffizi, "offices". The construction was later continued by Alfonso Parigi and Bernardo Buontalenti and completed in 1581. The cortile (internal courtyard) is so long and narrow, and open to the Arno at its far end through a Doric screen that articulates the space without blocking it, that architectural historians treat it as the first regularized streetscape of Europe. Vasari, a painter and architect as well, emphasised its perspective length by the matching facades' continuous roof cornices, and unbroken cornices between storeys and the three continuous steps on which the palace-fronts stand. The niches in the piers that alternate with columns filled with sculptures of famous artists in the XIX century. The Palazzo degli Uffizi brought together under one roof the administrative offices, the Tribunal and the Archivio di Stato, the state archive. The project that was planned by Cosimo I de' Medici, Grand Duke of Tuscany to arrange prime works of art in the Medici collections on the piano nobile was effected by Francis I of Tuscany, who commissioned Buontalenti the famous Tribuna degli Uffizi that united a selection of the outstanding masterpieces in the collection in an ensemble that was a star attraction of the Grand Tour. Because of its huge collection, some of its works have in the past been transferred to other museums in Florence—for example, some famous statues to the Bargello. A project is currently underway to expand the museum's exhibition space in 2006 from some 6,000 metres² (64,000 ft²) to almost 13,000 metres² (139,000 ft²), allowing public viewing of many artworks that have usually been in storage. In 1993, a car bomb exploded in Niobe room and classical sculptures and neoclassical interior of which have been restored, although its frescoes were damaged beyond repair. The identity of the bomber or bombers are unknown, although it was almost certainly attributable to the Sicilian Mafia who were engaged in a period of terrorism at that time. The collection also contains some ancient sculptures, such as the Arrotino and the Two Wrestlers. Ognissanti Madonna, 325 x 204 cm. Adoration of the Magi, 300 x 282 cm. The Madonna and St. Anna, 175 x 103 cm. Adoration of the Magi, 115 x 177 cm. Birth of Venus, 173 x 279 cm. La Primavera, 203 x 314 cm. Adoration of the Magi, 108 x 173 cm. Adoration of the Magi, 111 x 134 cm. Dukes of Urbino, 47 x 66 cm. Madonna and Child with Angel, 95 x 64 cm. Adoration of the Magi, 243 x 246 cm. Annunciation, 98 x 217 cm. Baptism of Christ, 177 x 151 cm. Sacred Allegory, 73 x 119 cm. Adoration of the Magi, 86 x 162 cm. Madonna of Long Neck, 216 x 132 cm. Venus of Urbino, 119 x 165 cm. The museum is mentioned in chapter XII of Henry James's 1875 novel, Roderick Hudson. It is said that "There are very fine antiques in the Uffizi." The museum is mentioned in Book 1, chapter 24 of Henry James's novel, Portrait of a Lady. "You'd have liked a few things from the Uffizi and the Pitti—that what you'd have liked," said Madame Merle. In the Piazza della Signoria. The Thomas Pynchon novel, V., contains a chapter centered around an attempted robbery of The Birth of Venus from the museum. ^ a b Top 100 Art Museum Attendance, The Art Newspaper, 2014. Retrieved on 25 July 2014. ^ Sigfried Giedion, Space, Time and Architecture (1941) 1962 fig.17. ^ Fossi, Gloria. The Uffizi. (Giuniti, 1999), p. 8.